The bay is a long lived and slow growing, pyramid shaped evergreen tree. While the tree can reach 15m in height, its slow, dense upright growth makes it an ideal specimen for a large pot. In this form a small garden can accommodate a plant without concern. It’s growth is slower when cultivated in a pot. The tree generally flowers only in warm climates, and the small, very fragrant flower buds open to tiny cream flowers, after which they become blue-black berries. These trees prefer a deep soil and if potting your tree, ensure the pot has a generous depth and that you use a compost enriched potting mix. It needs full sun and good air circulation. Bay prefers a rich, well drained but moist position. In areas with cold winters, sweet bay is best grown in pots and brought inside during the winter months or if the temperature is likely to go below -15°C. Pick green leaves for use at any time. Dry leaves out of direct sunshine and store in an airtight bottle. Sweet bay is indispensable in French and other Mediterranean cookery. The tough leaves withstand long cooking, so use them in soups and stews. Apart from meat and fish, they go well in dishes that contain lentils or beans. Bay is essential in a bouquet garni, which is made with fresh herbs or dried herbs wrapped in muslin. Bay is also used in pickling spice and garam masala. 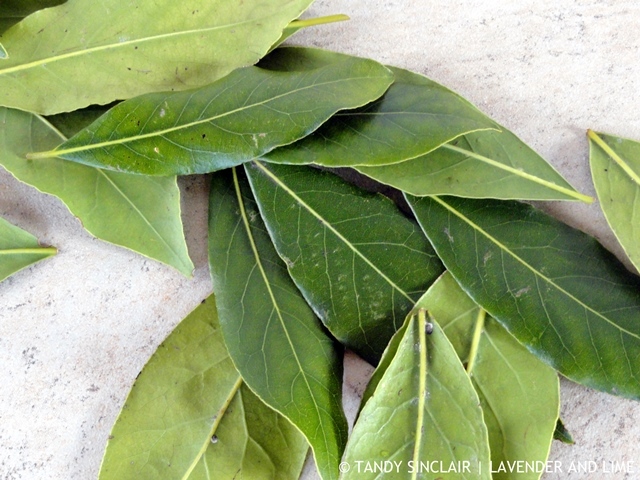 Fresh leaves tend to be bitter but the taste will diminish if they are left to wilt for a few days. Fresh sprigs stripped of a few leaves make aromatic skewers for meat or fish cooked over the barbecue. Dried leaves retain their flavour for about a year. Remove dried leaves from dishes before serving. I have recently found bay leaves simmered in a fresh tomato (softened onions, skinned and seeded chopped tomatoes) sauce give a really good flavour if the tomatoes aren’t all you hoped they might be! they are so nice to have! I have a bay tree – it’s not a easy tree to grow in Cape Town, especially in winter – it does not like lots of winter rain. Mine is growing nicely (about 1.5m tall now), but not bushy. Also a favourite with bugs. Pete is returning form his trip home today and said that our bay tree was looking very healthy. Yay, something survived while we have been away.